I got 25 asparagus plants in the mail a couple of weeks ago. Actually 50, because I split an order, but 25 were mine. I knew they were coming, but kind of put them out of my mind, because they are a lot of work. Planting asparagus is the kind of thing that if you do it right, you only have to do once… it’s a lot of pressure. I put in 10 purple asparagus plants about 4 years ago, and did them in a raised bed. My thinking was that all the directions say to dig a trench, then as the plants grow, add soil to them. I thought, why not put them on the ground, then add soil as the plants grow? I had excavated for our flagstone patio, and had a lot of topsoil, so I thought it would work…I thought wrong. It is dry here in Northern Colorado, and one of the benefits of the trench method is that the plants get more water. Out of the 10 that I planted, only about 3 are still alive, and I have never gotten a meal out of the planting. Last year, I was able to pick about 20 spears, but not on the same day, of course. I just ate them raw out in the garden. So, this year, I am working harder on it. Last Spring I put some horse bedding down in an area near the apple tree (I planted some perennials, but they didn’t work out (moment of silence for dead lady’s mantle)) so I had an area about 10 feet across with some pretty decent soil. 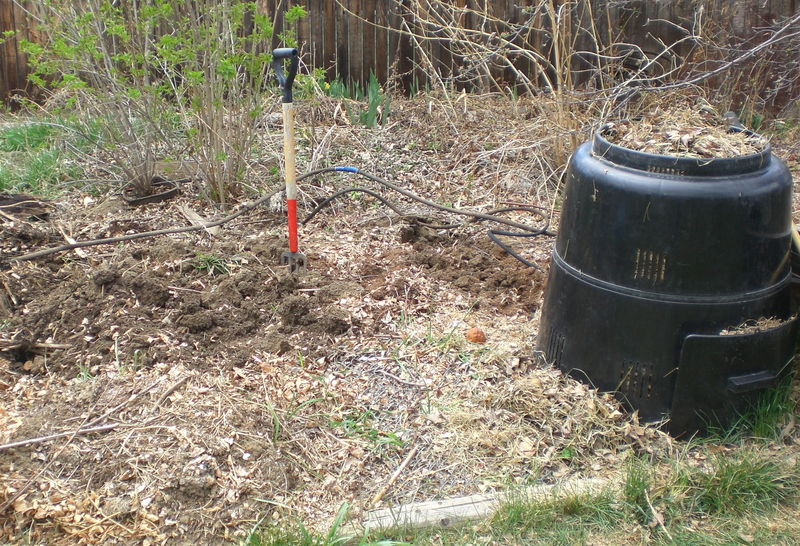 It was also the area I had hop-scotched my compost bin around, so there would be some pretty nice compost there, too. My poor little poin-and-shoot camera- it's like, "what did you want me to focus on here? the shovel? the dirt? what am I looking at here?" I figured instead of digging a long trench, I would do it in a horseshoe shape, and use the space in the middle as a vegetable bed this summer. This is where my tomatoes and peppers will go, so they can benefit from the water and compost, too. In Permaculture books, they call this a keyhole bed, because you access it from stepping stones in the center- it minimizes the amount of path you need to get to plants. The weekend the plants arrived, it had rained lightly, so the soil was actually digable- the end that hadn’t gotten as much horse bedding was clumpy and hard to get through, but the side that had been mulched was like slicing chocolate cake. Well, maybe not like cake, but it was certainly easier. We have clay soil, so the more organic matter, the better. I dug down about the depth of my shovel blade, and put the loose dirt in the center of the horseshoe.